You’re a good driver. You would never want to cause a motor vehicle accident. You would never get behind the wheel after a couple glasses of wine. You would never pull out of your driveway without your glasses. So surely you wouldn’t check your cell phone while on the road. After all, like driving under the influence of drugs or alcohol, distracted driving is dangerous, not to mention illegal. 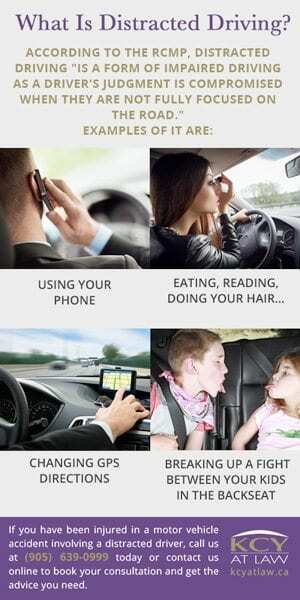 Yet distracted driving is shockingly common. breaking up a fight between your kids in the backseat. 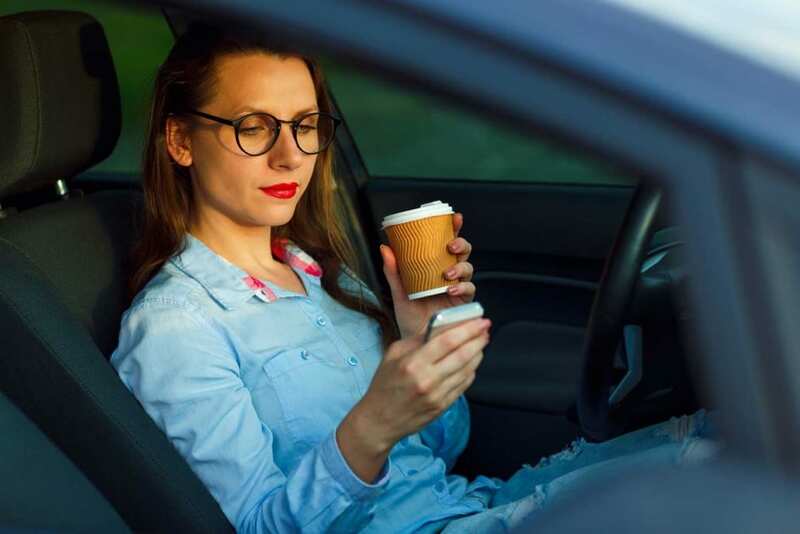 According to the Province of Ontario’s website, drivers using a phone are four times more likely to cause an accident than a properly focused driver. The Province’s website also notes that deaths from distracted driving collisions have doubled in the last 16 years. Furthermore, according to the CAA, texting while driving makes you 23 times more likely to be involved or nearly involved in a collision. If you have been involved in a motor vehicle accident make sure you check out our Dos and Don’ts of Motor Vehicle Accidents. While specific rules and penalties vary from province to province, it is illegal to use hand-held electronics while driving. This includes your mobile phone, GPS, E-reader and any other portable electronic device. Even holding a cellphone while driving is against the law. Hands-free and mounted devices like Bluetooths and GPS navigation systems, however, are permissible. a 30 to 90-day licence suspension if you have a learner’s permit. Being prepared for your trip, however short or long, is the best way to stay focused when you are on the road. Plan your route and set up your GPS or other navigation device before you leave. Have your playlists or CDs cued and ready to go so you are not trying to find just the right tune when you should be checking your blind spot. Set up voice control on your mobile devices. Ask passengers to handle any incoming calls or texts. Better yet, take the opportunity to disconnect and turn your phone off altogether. Be present in the moment and devote your full attention to the road and your surroundings. If you do need to use your phone, including in the case of an emergency, first safely pull your vehicle over to the side of the road and put on your hazard lights. If you have been injured in a motor vehicle accident involving a distracted driver, call us at (905) 639-0999 today or contact us online to book your consultation. KCY at LAW are experienced personal injury lawyers with the expertise and compassion to help you get the settlement you deserve. 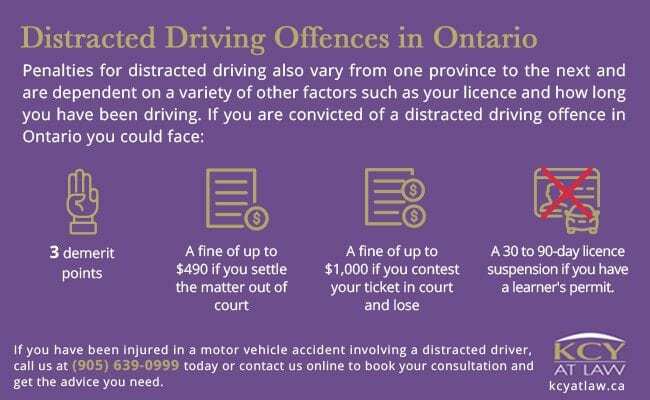 https://www.kcyatlaw.ca/wp-content/uploads/2017/01/Distracted-Driving-The-New-DUI.jpg 922 1382 Kathy Chittley-Young https://www.kcyatlaw.ca/wp-content/uploads/2018/01/KCY-at-LAW.svg Kathy Chittley-Young2017-01-11 17:42:512019-03-03 20:17:57Distracted Driving: The New DUI?